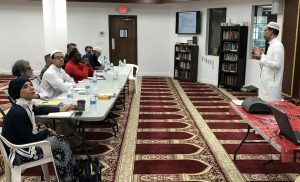 (Sunrise, FL, 04/06/2019) – The South Florida Muslim Federation held a workshop on Saturday, April 6th at the Islamic Center of Broward (ICB) training individuals in the Muslim community on the ins and outs of how to deliver a Friday sermon (khutbah), as well as how to serve as a voluntary chaplain in several institutions with need for Muslim chaplains. 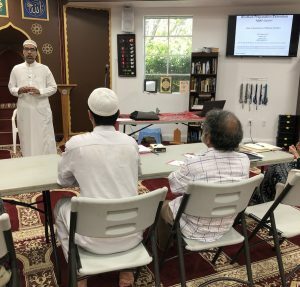 Brother Shakeel Hye led the Khateeb training with a thorough presentation going over not only the religious requirements to fulfill a Friday khutbah, but also very practical presentation and public speaking guidelines with specific focus on the Friday Jumu’ah as a venue. In addition, Brother Wilfredo Ruiz led an introductory chaplain training, drawing on his experiences as a Navy Chaplain Officer and his education at the Hartford Seminary. Participants walked away with a clearer picture of chaplaincy and a path to serving as volunteer chaplains at many institutions. 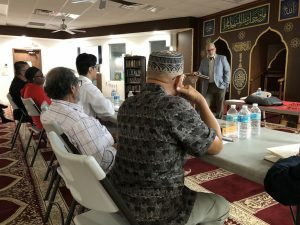 The South Florida Muslim Federation will hold more trainings of this kind to help address the need for Muslim speakers, chaplains, and spiritual advisors in all manner of institutions including prisons, jails, hospitals, police departments, colleges and universities. Mash’Allah this is really awesome! May Allah SWT reward you by alferdous ala’la. Kindly, will this training be repeated at any other locations please? Salamualiakum, brother. Yes Indeed Inshallah, this is going to be an ongoing effort to train more community members to provide services / khutba at different places – prisons, high schools, hospitals, etc. Please stay tuned; make sure you have joined out mailing list if not done already.